Hi, this is Karen here. I've thought about the best way to continue on with the great tradition Trudi handed over to me - I do remember how she was such a caring person & shared so much stuff & I've tried to use that as my focus for the weekly inspiration - looking for demos that share how they create their projects. A big thank you all the demso that played along with the weekly challenges but it seems to me with the Just Add Ink weekly challenges that maybe the way forward for NZSU blogs & to carry on with Trudi's tradition is to ask demos with great projects to write them up for us & tell us a little bit about themselves - so no pressure but Paula Dobson has agreed to do the first one with her Impossible Box & then Mr Linky may return for us all to play along with too. If you'd like to share something do contact me directly or I'll be tapping you on the shoulder to help. This is a great place which I know we all enjoy & benefit from. Anne is this week's inspiration - looks like she's been having fun playing with some secret sisters but we'll just have to play amongst ourselves and the laundry bleach. There is a tutorial on SCS which you can check out HERE if you've never used bleach before. So our challenge this week is to create something using bleach. Entries closing at Sunday around 8pm - happy stampin' in the interim. Megan is this week's inspiration with her lovely tutorial on making paper flowers - so do check out how to create them & say hi whilst you're there as she's new to the world of blogging. 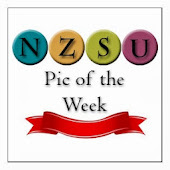 Your challenge this week is to make some & use them on a card or a box etc. So I'll leave Mr Linky open until next Sunday at 8pm. Looking forward to seeing what fabulous projects you all come up with this week. 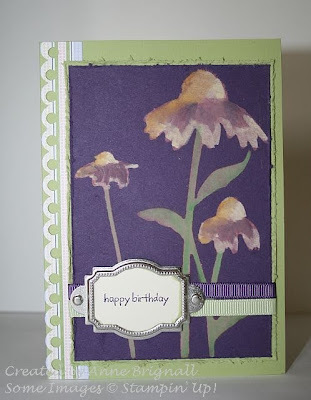 Happy stampin' in the meantime! 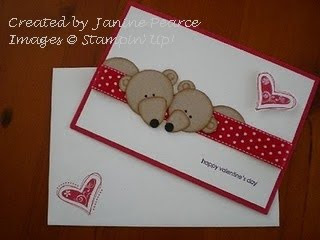 Janine is this week's inspiration she's created a lovely punch art teddy bear card using punches. Anyone that knows me knows I hate punch art but I will make an exception this week as Janine's card is so adorable. So your challenge this week is to KReate a card using punch art & link below using Mr Linky. Close off normal time next Sunday at 8pm.